Cool photo here of iconic vintner, Marc Perrin (L) with Brad Pitt at the Miraval vineyards. 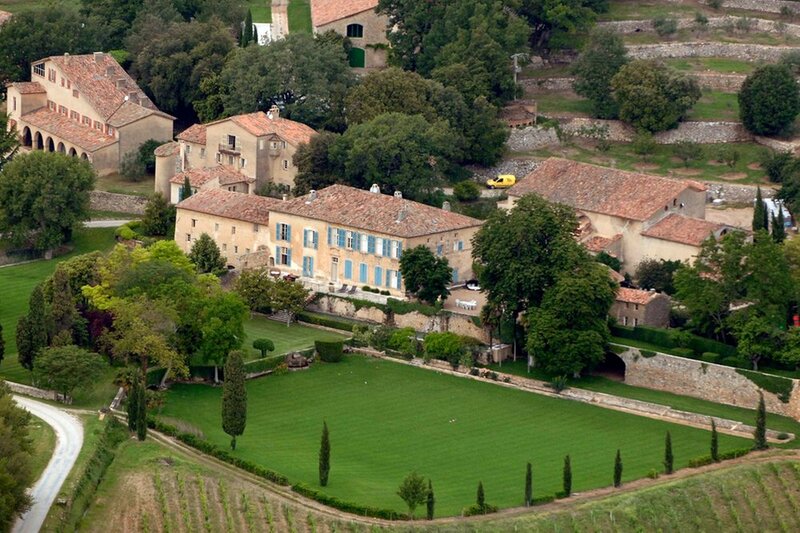 A marvelous combination of Hollywood drama and great wine, Miraval, a 1,200 acre estate in Provence, was founded by acting icons Brad Pitt and Angelina Jolie. Married at Miraval, Pitt and Jolie prior to their split lived there since 2008. The property boasts pine forests, olive groves, terraced hillsides, working vineyards, a private lake as well as a moat. Much of the chateau dates back to 17th century, including 35 rooms in the main house as well as several tenant residences.The estate also contains remains of a Romanesque chapel, as well as the famed vineyard from which the Miraval Rose comes from. The recording studio at Miraval has housed some famous musicians including personal favorites Sting and The Cranberries (R.I.P. Dolores O’ Riordan). Purchased in 2012 for an estimated $60 million, records indicate that in 1252 philosopher and theologian Saint Thomas Aquinas even visited the Miraval estate. The vineyard itself is very large, as Jean-Pierre and Francois Perrin are the iconic vintners behind this great Rose wine that produce white and rose wine from the 500 hectare property. Miraval produces a ton of Rose (roughly 200,000 bottles) and despite the quantity of wine produced, the quality of the wine has been apparently throughout the past five vintages. The latest vintage Rose, comes from the year of the Pitt/Jolie split and it is not clear who will own Miraval going forward. The 2017 Miraval Rose (WWB, 90) is a fresh and enticing Rose, that rivals the best produced from this storied estate. This is a marriage of red fruits that is not to be missed. Learn more about Miraval at http://miraval-provence.com/en/ Here is the new Miraval Rose review.